When I hiked my first 4K peaks, Lincoln and Lafayette, six years ago, I knew nothing about the NH48 list or the Grid, and never could have imagined the journey that started on that day. But I knew I wanted to return to these beautiful White Mountains to keep on hiking. Over the next 6 years, hiking the 4Ks added so much to my life: it gave me peace and purpose during difficult times, it gave me confidence, it was my weekly escape, it forced me to face environmental challenges that I wasn't sure I could handle, it encouraged me to test my physical limits beyond what I thought I was capable of, it gave me an excuse to eat huge quantities of Nutella, but most significantly, it brought into my life the most wonderful community of hikers & friends, and my husband, Jeff (yes, we met hiking a 4K!). Thank you to everyone who made this journey so incredibly special - I am humbled to be part of this community and grateful to have the opportunity to spend my time with wonderful friends in these beautiful mountains. Special thanks to Jeff, who is the most amazing partner I could ask for (and has completed 97% of the grid with me) and also to Ed Hawkins for putting this challenge out there for all of us - it's been such a fun adventure! AMC Trail Adopter for the Garfield Ridge Trail (from the summit of Lafayette to the Mt. Garfield Tr) since 2013. 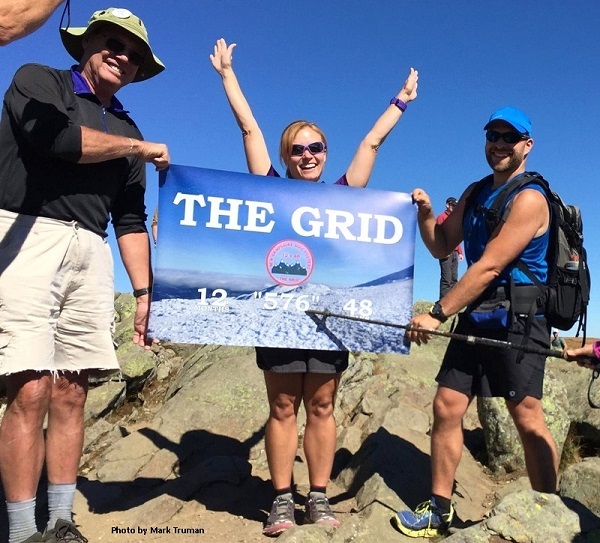 Finished the Grid on Moosilauke with 13 other grid finishers and a wonderful group of friends - Sept 2015.